Hear about the challenges associated with the college transition year and learn about effective strategies for helping prepare your students for success through the Jed Foundation’s Text, Talk, Set to Go platform. 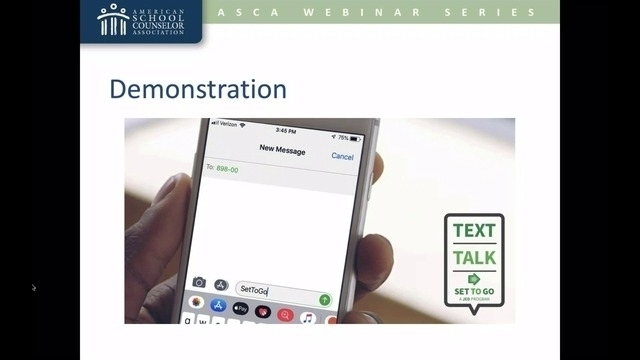 Text, Talk, Set to Go is a free conversation designed to help junior and senior high school students get prepared for college. Students gather in small groups with one cell phone and text SETTOGO to 89800 (try it now). The small groups receive a series of pre-programmed text messages to get them talking together about the college transition and how they can prepare themselves emotionally for it. Text, Talk, Set to Go is available March–May 2019 for your students. Learn how to bring the activity to your school, in partnership with ASCA and the Jed Foundation, and get your students set to go. Download accompanying handouts here.